Stay current on changes and developments in corporate law with a wide variety of resources and tools. Apple Inc. topped a human rights group’s Nov. 16 ranking of corporate efforts to clean up sourcing for minerals that can directly or indirectly finance conflict in the Democratic Republic of Congo. The maker of iPhones and other devices scored highly on a measure that shows it can trace its supply chain to a key choke point where these so-called conflict minerals are processed before they’re used in products. Apple was also the only company to get full credit from the Enough Project for identifying red flags and removing suppliers that fail to meet its standards. It removed 22 such suppliers in 2016, according to its most recent supplier responsibility report. The nonprofit’s ranking covered 20 of the largest companies in consumer electronics and jewelry, two of the industries that consume the most tin, tungsten, tantalum, and gold. It drew in part from a survey Enough sent the companies and from required corporate reporting to the U.S. Securities and Exchange Commission on these minerals. Such disclosure has been targeted for rollback by regulators and Republican lawmakers, who on Nov. 15 advanced their latest attempt (H.R. 4248) to repeal the rule. The Enough Project found that consumer electronics companies, including Apple and Alphabet Inc.’s Google, are generally further along in their supply chain transparency efforts than jewelry retailers. Google got the next best score in its first time being ranked since it started selling products such as cell phones that contain these minerals. One factor was Google’s financial support for an initiative that has developed standards for smelters and refiners to verify the source of the minerals they process and the conflict status of mines where the minerals originate. 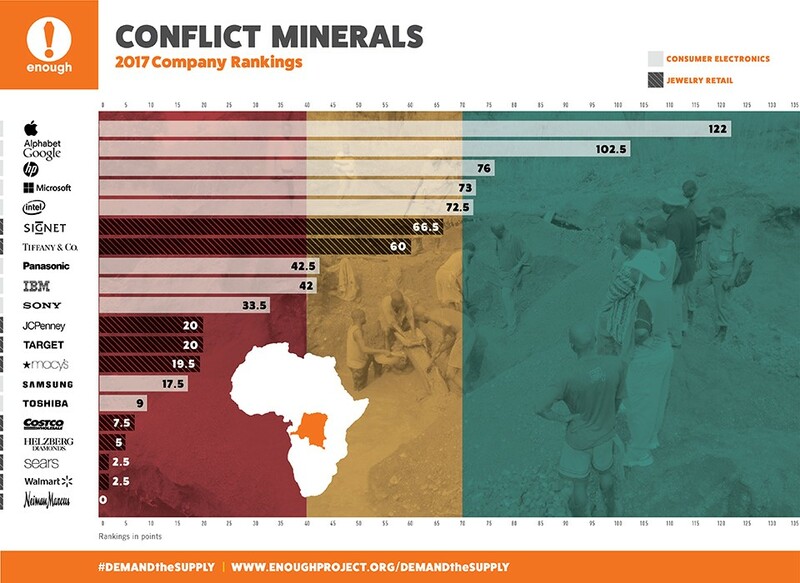 In Enough’s inaugural ranking in 2010, none of DRC’s mines had been verified as conflict-free. As of April, there are 420 conflict-free mines. Still, it said violence has not completely disappeared from Congo’s minerals trade and the country faces an escalating political crisis. The highest score in the jewelry industry went to Signet Jewelers Ltd., the company behind brands such as Kay Jewelers and Zales. It was the only jewelry company to get credit for sourcing verifiably conflict-free gold from the DRC. Signet and Tiffany & Co., the second highest jewelry scorer, also got points for coming out in defense of the SEC’s conflict minerals disclosure rule. The eight other jewelry retailers Enough examined lagged far behind. “Signet and Tiffany are in a league of their own when it comes to jewelry retailers,” Annie Callaway, who authored the report and manages advocacy at the Enough Project, told Bloomberg Law. Callaway said the jewelry industry as a whole should step it up, since it’s among the world’s largest end-users of gold, which federal research shows is the toughest conflict mineral to tackle. The ranking’s lowest score went to Neiman Marcus Group. The department store didn’t make its conflict minerals policy public on its website and didn’t respond to Enough’s survey. It also didn’t return a request to comment for this story.